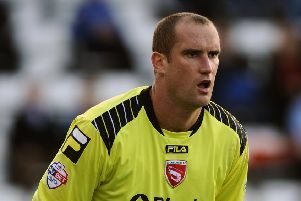 GARRY Hunter is the most high-profile name to be released by Morecambe FC. The versatile 27-year-old midfielder made more than 300 appearances for the club after coming through the club’s youth system. Youngsters Niall Cowperthwaite, Sean Breen and Joe Culshaw have also been allowed to leave the club. Jim Bentley has however offered new one-year deals to Joe Mwasile, Dan Parkinson and Joe McGee. The Shrimps boss is also in talks with Stewart Drummond about a new playing contract, to go alongside his role as reserve team manager. Bentley said: “Releasing players is one of the hardest jobs you have to do as a manager and it is not a nice thing to do. “I would like to thank all the lads for their service especially Garry who has been here a long time and given his all for this club.